An article written by Irwin Kellner (MarketWatch) proclaims that the Fed is actively taking liquidity out of the market. Guess what? The Federal Reserve has not only stopped depositing copious amounts of liquidity into the economy -- it now appears to be in the process of making a sizable withdrawal. Mr. Kellner argues that the evidence for such sudden action can be seen in the measures of money supply. For example, the monetary base -- the raw material for the money supply -- has fallen at a seasonally adjusted annual rate of 8% from early April of this year through mid-August, after soaring at a 187% pace during the previous eight months. There is no clear downward trend here. But even if there was a decline, the reality is that the Fed has little control these days over the monetary base. The bulk of this measure is represented by cash that banks deposit with the Fed. In the past the Fed did not pay interest on these deposits and banks only kept the minimum required amount there. The Fed could increase and decrease these requirements, thus controlling the money supply. But last year the Fed started paying interest on such deposits and the banks flooded the Fed with funds - depositing orders of magnitude more than was required. The banks were petrified of depositing funds at other banks, so a riskless deposit with the Fed was the best option. Now the banks use their Fed account as their piggy bank - they put money in and take it out as part of their cash management needs. And even if this measure were to drop, it would just mean that banks are doing a little more lending. Sorry to disappoint Mr. Kellner, but the Fed has not been "making a sizable withdrawal", because the central bank has no control of the monetary base in this environment. The only way the Fed could influence what the banks hold with them is to set the rate they pay on deposits back to zero. 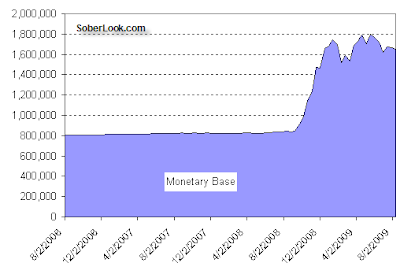 As a result, the Fed's two measures of the money supply, M2 and MZM, have begun to contract. M2 has shrunk at a 3% pace since the middle of June, while MZM, the St. Louis Fed's measure of liquid money, is down by 2% over the same period. OK. 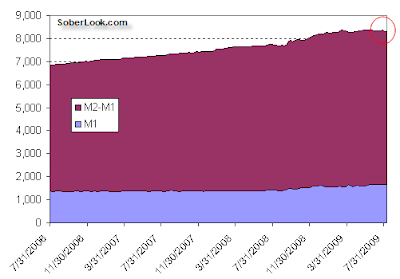 Here is the M2 money supply trend broken into the M1 and the "non-M1" components. M1, which is physical cash and checkable deposits, has not moved down. The non-M1 component of M2 represents household savings deposits, time deposits (CDs), and retail money market funds. That component has dropped slightly. Again, does the Fed have anything to do with the amount of household savings decreasing slightly? Maybe the Fed tells Mr. Kellner when to spend some of his savings, but the rest of us (at least for now) have control of what we do with our money. In fact the simplest explanation of the slight drop in retail deposits may have to do with Cash for Clunkers. People with some savings simply saw this as an opportunity to buy a car. And maybe (as controvercial as it may be) some people with savings are starting to buy homes. Reading the money supply tea leaves and interpreting it as some sort of action by the Fed in this environment is pointless. Of course it is possible that Mr. Kellner has been adding something else to his tea.